PITTSBURGH: This was not the way the record should have come. For a guy who cares as much about his teammates and is as committed to his profession as Browns kicker Phil Dawson, he should have passed hall of famer Lou Groza on the Browns' all-time field-goal list with a memorable kick. A kick like his improbable one a few years ago against the Buffalo Bills in blinding snow at Cleveland Browns Stadium. Or for that matter, any one of his many game-winning kicks would have been more appropriate. Instead, Dawson had to settle for No. 235 coming on an otherwise meaningless first-quarter 39-yard field goal in the Browns' 28-10 loss Sunday at rival Pittsburgh. It's a game that will probably be remembered more for wide receivers Josh Cribbs and Mohamed Massaquoi suffering injuries after hits by Steelers linebacker James Harrison than Dawson's milestone. 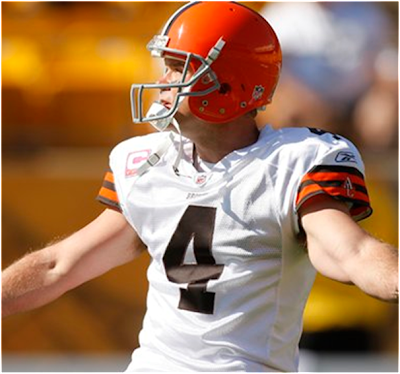 Last week, Dawson tied Groza on the Browns' list in a loss against the visiting Atlanta Falcons. Afterward, he spent time with his family as a reward.